The world’s simplest labeling protocol: Mix and then Stain ~ it really is that simple! Mix-n-Stain™ CF® dye small ligand labeling kits are designed for rapid labeling of small (MW ~ 150 – 5,000) and relatively high affinity biological ligands (or substrates). Labeling takes about 30 minutes, without a final purification step. The ligands to be labeled must contain an aliphatic amine group that is not required for biological activity of the ligand. The amine group will form a covalent linkage with the reactive CF® dye provided in the kit. For example, suitable ligands or substrates include SNAP-tag®, CLIP-tag™ and HaloTag® ligands with an aliphatic amine. Many other small ligands are also possible candidates if they meet the criteria described above. Simply mix your small molecule ligand with the reaction buffer and the optimally formulated dye provided, and incubate for 30 minutes, followed by a brief 5 minute quenching step. No reactive Mix-n-Stain™ dye is available at the end of labeling; therefore the conjugate is ready for cell staining and imaging without further purification. Mix-n-Stain™ labeled ligands perform comparably to commercially-available pre-labeled ligands (Figure 1), at a fraction of the cost. We also offer TMP-PEG3-Amine for making fluorescent TMP tags using the kits. A major advantage of Mix-n-Stain™ kits is our superior CF® dyes, many of which are brighter and more photostable than Alexa Fluor® dyes and other similar commercial dyes. Several of our CF® dyes, such as CF®405M, CF®633, CF®640R, CF®647, and CF®680R, have been demonstrated to be ideal probes for super-resolution and single molecule imaging (see references). With a choice of ten CF® dyes for cell surface labeling and three CF® dyes for intracellular labeling, you have significant freedom to label your small molecule ligand with colors ranging from blue to near-infrared, making multi-color detection simple and affordable (Figures 2, 3). 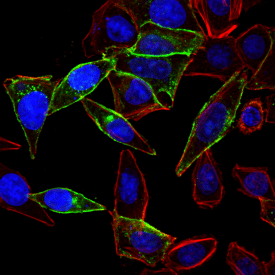 For live cell imaging, the Mix-n-Stain™ kits are ideal to generate fluorescent chemical tags that provide smaller, brighter, and more versatile alternatives to fluorescent proteins. Labeling of various chemical tags with Mix-n-Stain™ kits yielded highly efficient and specific labeling of the target proteins both on surface and inside of living cells. The Mix-n-Stain™ kits have also been proven compatible with fixed cell imaging (Figure 3) and gel-based assays (see the Mix-n-Stain™ Small Ligand Flyer for more details). Figure 1. Live cell surface imaging of HeLa cells transfected with CLIP-tag™-NK1R fusion protein, detected with (A) CLIP-tag™ conjugated to green fluorescent CF®488A using Mix-n-Stain™, or (B) CLIP-Surface™ 488 ligand from New England Biolabs. Nuclei were stained blue with Hoechst 33342. Figure 2. Multiplex imaging in live HeLa cells using Mix-n-Stain™-labeled ligands. CF®488A SNAP-tag® ligand was used to detect surface expression of SNAP-ADRβ2 protein (green). 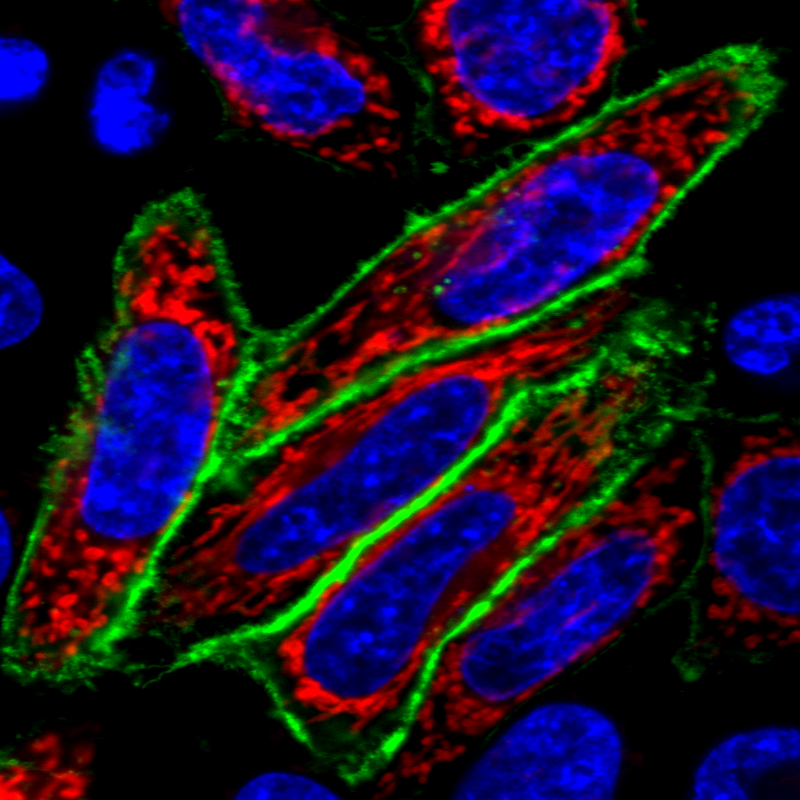 Mitochondrial CF®540 CLIP-tag™ ligand was used to detect mitochondrial CLIP-Cox8A protein (red). Nuclei were stained blue with Hoechst 33342. Figure 3. 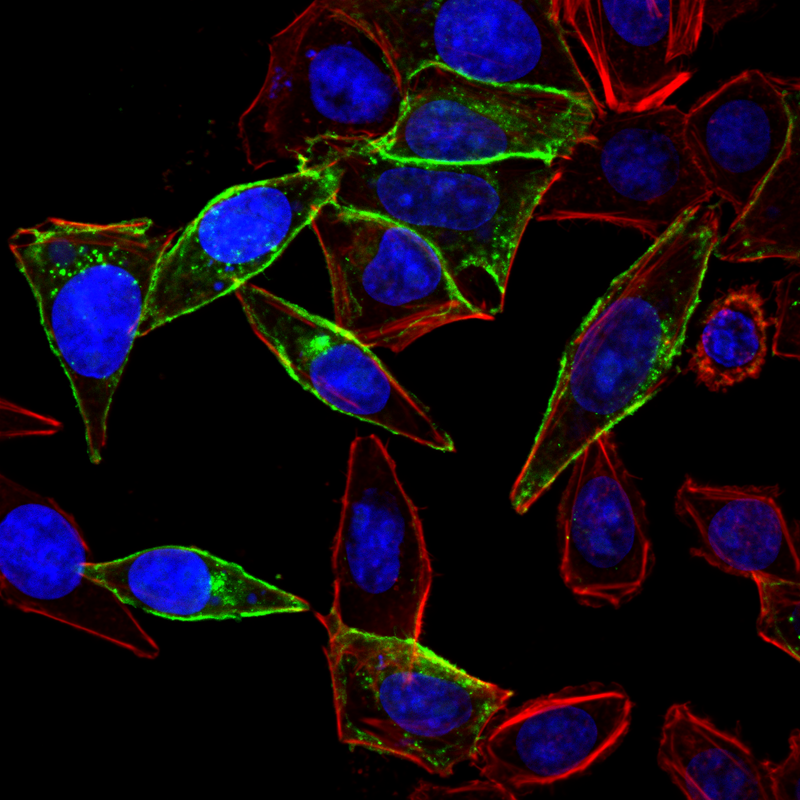 CLIP-tag™ ligand was labeled with the CF®488A Mix-n-Stain™ Small Ligand Labeling Kit, then used to detect cell surface expression of CLIP-NK1R protein (green) in live HeLa cells. Cells were then fixed, permeabilized, stained with CF®633 Phalloidin (red), and mounted with EverBrite™ Mounting Medium with DAPI. SNAP-tag and CLIP-tag are trademarks or registered trademarks of New England BioLabs; HaloTag is a registered trademark of Promega Corporation; Pacific Blue, Texas Red, and Alexa Fluor are trademarks or registered trademarks of Thermo Fisher Scientific; BD Horizon is a trademark of BD Biosciences; Cy Dye is a registered trademark of GE Healthcare; IRDye is a registered trademark of LI-COR Biosciences. Mix-n-Stain™ kits use revolutionary technology that dramatically simplifies antibody labeling and requires no purification. The labeling is covalent and stable. Available with your choice of 24 CF® dyes, biotin, FITC, fluorescent proteins, enzymes, or haptens. We offer a wide spectrum of CF® dye colors with a full selection of reactive chemistries, as well as other high quality reactive dyes and biotinylation reagents.